Cheesy Zucchini Gratin is a great side dish for all of those upcoming summer BBQ’s and potluck parties! 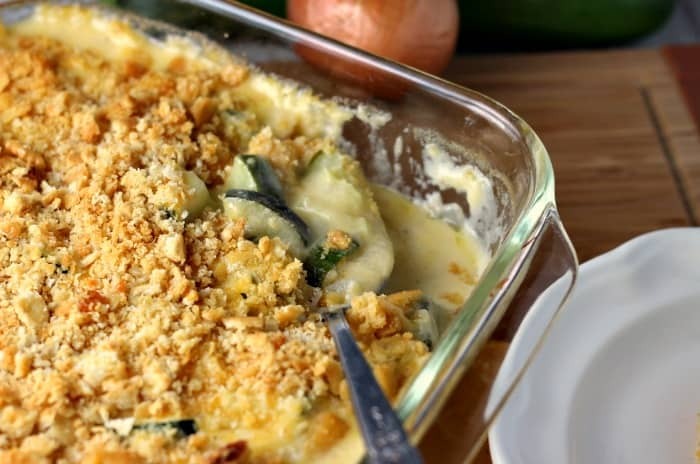 It’s full of fresh zucchini and sweet onions nestled a cheesy sauce that compliments just about anything you serve it with. I love just about anything with the name “gratin”… Potato Gratin, Cauliflower Gratin, Sweet Onion Gratin. This recipe for Cheesy Zucchini Gratin is no exception. It’s really delicious and makes a wonderful side dish that goes with just about anything! According to Wikipedia, the French word “gratin” refers to the shallow ceramic dish that these recipes are normally baked in. 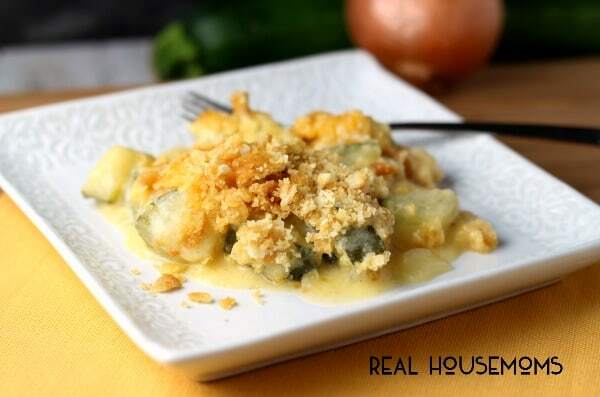 Traditionally, gratin recipes include cheese, breadcrumbs and butter and have a browned, crispy topping. I’ve gone a bit against tradition here, and used an 8″ x 8″ Pyrex dish to bake this in and used buttery crackers for the topping, instead of breadcrumbs, but the recipe is true to it’s name in every other sense! This recipe is adapted from an Ina Garten recipe. I just love, love, love Ina and her simple, yet utterly delicious, recipes and cooking style. I always know, when I start with an Ina recipe, the end result will be a successful one. She is especially adept at creating wonderful comfort foods like this one. I mean cheesy…who doesn’t find comfort in cheese? It won’t be long before everyone’s gardens are overflowing with zucchini and even if you don’t have a garden, zucchini will soon be abundant and priced right in the grocery stores. Why not turn all that zucchini into something spectacular? This is a wonderful recipe and my family enjoyed it very much. I know it will show up on my table again and again. I think maybe the only way to make it better might be to add some bacon next time! What do you think? 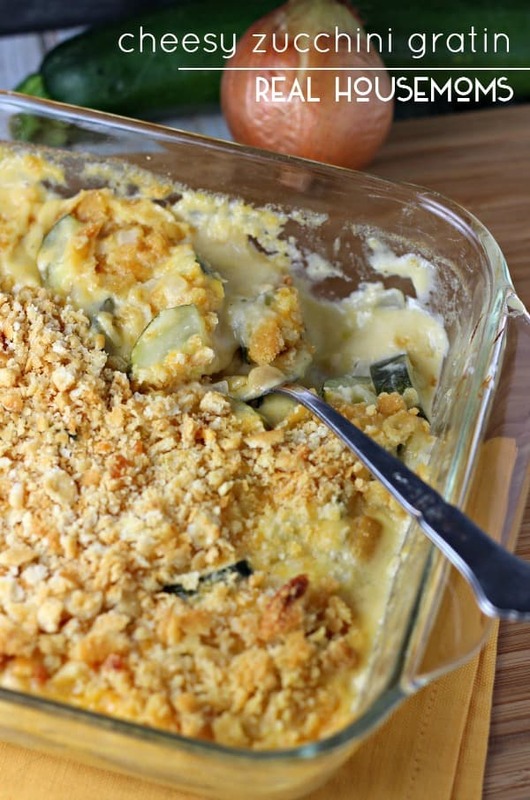 Cheesy Zucchini Gratin is full of fresh zucchini and sweet onions nestled in a rich cheesy sauce then topped with a buttery cracker topping. It's the perfect side dish for just about anything! Spray an 8" x 8" glass baking dish with non-stick cooking spray, Set aside. In large non-stick skillet, melt 1/4 cup unsalted butter. Add onion and cook over medium heat for about 6 minutes, until softened and translucent. Add in garlic and saute with onion for about another minute. Add in the zucchini. Sprinkle with salt, pepper, nutmeg and flour. Mix and cook for one minute. Take pan off heat and add in 1/2 cup cheddar cheese. Pour mixture into prepared baking dish. 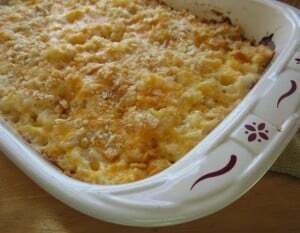 Top with remaining cheese then crushed crackers. Drizzle with melted butter. 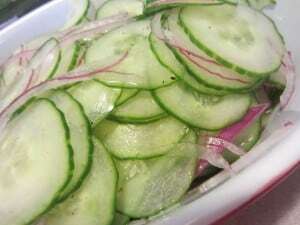 Bake in oven for 18-20 minutes, or until topping is browned and zucchini is tender.